Alison Griffin and Ingrid Abreu Scherer presented at our spring event in London in April to talk to us about The Mill and the St James Street Big Local area in London. The St James Street area of Walthamstow was selected as a Big Local area in December 2012. It is home to about 5,000 people and the area is in North East London. It is at the end of the mile-long Walthamstow market and around the busy St James Street, which has good bus and rail links. To develop a vision and priorities for the area, St James Street Big Local ran workshops with people locally. 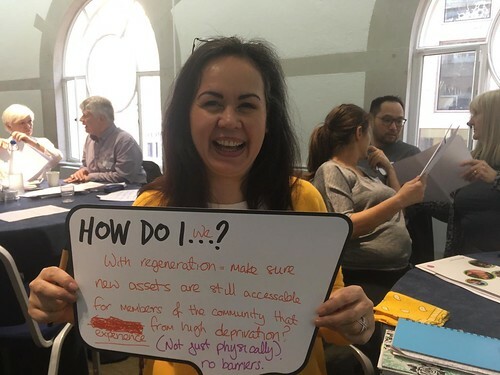 "St James Street Big Local's vision for the area in 2025 is that our diverse community will be living in a cleaner, greener, safer area with a reinvigorated local economy." Many Big Local areas have a range of activity and local projects that pre-date Big Local. One of the programme’s strengths is its ability to link with other local activity, support and collaborate, avoid duplication and add value with volunteer time, money and profile. The Mill, a volunteer run community hub in St James Street was established before Big Local in the area. However, as residents, a number of people involved in the Mill, are also involved in Big Local. Through Big Local’s community conversations, the steering group identified nine themes. The highest percentage of people’s responses related to communal spaces, facilities and activities. Supporting the work of The Mill scored 73 out of 100, with 546 responses. It is a key priority for St James Street Big Local. The story of the Mill started as a community library campaign in 2007. It was the only library and community resource in the area and the council planned to shut it. The community felt strongly about this and were passionate and persistent in their campaign to keep it open. The building was about to be sold to a developer. But residents found an opportunity through the Nesta Neighbourhood Challenge which supported community-led action and innovation to help people address their priorities. The community put in their ideas and were chosen. The library campaign was very grassroots and rallied many local people together. The group paid the council commercial rent for the year to stop the sale and volunteers got the building ready to be opened and used. They registered as a charity, hired staff, got a series of events ready and then they opened! The Neighbourhood Challenge funding was for 12 months only, which the group used for building work. They are pleased that they made the big decision to register as a charity early on as three years down the line they now have their own accounts and are in a position to apply for other funding. Only after they had proved themselves were they able to negotiate with the council for reduced rates. The design of The Mill includes a large open space which holds a community living room, a children’s room and an honesty library. Everyone is welcome and there is no need to sign in but somebody is always on reception. The building is open six days a week and shut on Mondays. Alison says that they are innovative in how they save money and raise income, keeping true to their community ethos. For example, they saw a demand for low cost work space and converted the upstairs into offices at affordable rates. These short term office spaces are taken by local organisations or individuals who have their own keys. People and groups can also hire rooms. Alison tells us that one of the biggest things for them is how much they can achieve without spending money. The Mill has over 200 volunteers supported by a volunteer coordinator, with many people contributing a little on their own terms. The Mill has started a friends’ scheme for people who are able to contribute financially which costs £30 per year. This provides a source of vital unrestricted income. As a group they have piloted consultancy work and pitched and won a community project tender in another part of the Borough. Ingrid adds that the way they do things is important because it adds strength to the community. They aim to support each other in the building, for example through an English conversation group or a place where people can drop in to get help with an application. There is lots of very informal support but also more formal support through a community mentoring scheme. Two key elements for the Mill’s success have been trust, and taking risks. They took a risk with the support of a group of local architects who support community ventures. The group trusted them with the development of the building even though they had no track record. They also trusted local groups and associations to know their local community well and better than anyone else outside. This has led to the growth of projects like an Asian women’s space and Coppermill Recycled Teens which has been so successful it has now moved on to another building. Ingrid says that they want to make a real difference to the area and be able to show that their approach works. To find new ideas and solutions they use community competitions where they challenge people locally to come up with ideas that help meet their priorities. Sometimes they target specific groups such as older people, or young people, or people with disabilities or carers. The Mill has a range of ways to support local groups. They can offer free room hire (subsidised through other funding), help people with small grants, promotion and writing, and getting stories into the press. They also provide training for groups, including on budgeting and community engagement or assign a mentor to a group to help plan, deliver and measure impact. Alison and Ingrid feel that their key to success includes thinking ahead and continuing to listen to their community which changes a lot very quickly. They watch out for trends and long term plans and aim to stay nimble and innovative. As a group they strive to keep bureaucracy low as well as absorb the shock of bureaucracy on small groups from others, like the council. They seek to be open about anyone coming through the door and responsive to 'weird ideas and long shots'! They look to trust their ability and passions, remain close and connected to the volunteers and recognise that usually all the resources needed are held by the people in the room.